There is a diverse range of properties at the Spruce Creek Fly-in. Literally a small village, Spruce Creek was masterfully designed to offer a self-contained mixture of commercial and residential neighborhoods inside the community. Some neighborhoods are single-family, some are zero-lot line, others are multifamily townhomes and we also have condo units. At the center of Spruce Creek, in the immediate areas of the runway, we have a commercial section with diverse businesses and private hangars and offices. The best way to visualize it all is with the Spruce Creek Fly-in Map , which provides an interactive aerial view of the community. In all, The Spruce Creek Fly-in encompasses almost 5,000 residents, 1,300 homes, 700 hangars and 14 miles of taxiways sharing a unique life in this private, security-patrolled and gated village. Taxiway homes are properties with direct access to taxiways. Most Taxiway Homes include an attached or detached hangar and we call them "Hangar Homes". While the majority of Taxiway Homes are single-family residences, there are a few villas, duplexes and condos with access to taxiways as well. Golf Course Homes are those located on the Spruce Creek Country Club's golf course. Most have great views of the fairways. An ocassional errant golf ball might end up in their backyards. Homes that may not have direct access to the taxiways or the golf course but that usually include views of the nature preserve that surrounds much of Spruce Creek. Some Nature homes have direct access to the Spruce Creek and may have docks to launch canoes and small boats. Also considered "Nature Homes" are all other homes in Spruce Creek that do not fit any other category. These provide an alternative for those who wish to enjoy the security and lifestyle of Spruce Creek but do not need an attached hangar nor prefer being directly on the golf course. These are located away from the nature areas but often include beautifully landscaped grounds and artificial lakes in their surroundings. Spruce Creek offers several planned neighborhoods that include condominiums with a worry-free lifestyle, private neighborhood pools and recreation areas. Condominium units have one or two-stories with diverse designs. Commercial, Business- zoned Hangars are available in the commercial and offices area of Spruce Creek. These are mostly separate from residential properties. The allowable uses vary and may include a variety of commercial enterprises in addition to the storing of aircraft. Uses include recording studios, furniture building, warehouse storage, storage of Recreational Vehicles, cars and boats, Exercise Training Facilities and more. There are several hangar developments, each with its own condominium association, rules and regulations. A few vacant lots are available to build your custom home. 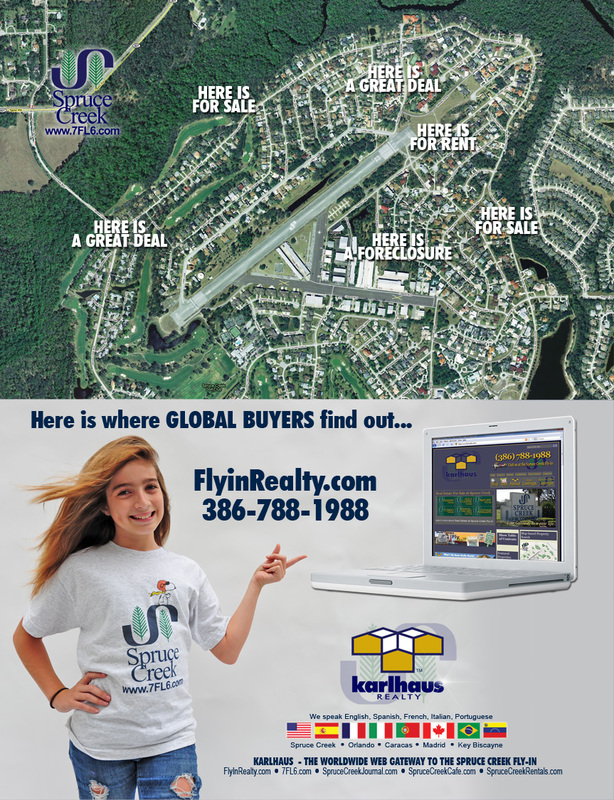 KARLHAUS REALTY can assist you in viewing and purchasing any of the properties available at the Spruce Creek Fly-in regardless of which Real Estate company has the listing or represents the seller. Through special agreements, we also have access to properties that may be available but not listed in the area's Multiple Listing Service (MLS). The professionals at KARLHAUS REALTY are ready to be of service to make reality the dream of owning property at Spruce Creek. These are tough times; run away from any broker that tells you otherwise. In the midst of the curent mess there are opportunities, however. Values have come down dramatically and in many cases they are below replacement costs. ...if you buy below intrinsic value, you will eventually make money, no matter what. It may not be tomorrow, but when something is acquired at prices below intrinsic value, the risk to the downside is much smaller than the potential upside. For those that recognize opportunity when everyone else is running away here are the ten most important questions to ask your broker before making that offer. When the demand for houses in a sizzling marketplace outweighs the supply of houses available, many consumers think the highest offer is a sure-fire way to claim ownership of their dream home. Similarly, in a panic-mode housing market such as the one we have right now, the old axiom “Analysis Paralysis” becomes an obstacle to getting the deal you want. While you wait for the prices to hit “bottom”, the savvy buyers snap-up the property you really want. The professionals at KARLHAUS REALTY™ know that bidding for a house doesn't always require upping the stakes and that the “bottom” is an ephemeral quantity as no one ever knows the bottom of a cycle until it has passed by. In the end, it comes to well-informed negotiation. Negotiation is not just offering less than the Seller is asking and waiting for a “yes” or “no”. Negotiation is a trade off of value, timing and intangible benefits between the two parties to arrive at equilibrium of terms that both are willing to accept. One tactic that works in any market is to accommodate the seller as much as you are able. As a buyer, you have to be flexible and willing to sacrifice a bit. Whether it's being willing to close one month earlier or later, do your best to meet the seller's desired closing time. Additionally, be willing to overlook the more minor and but less-than-perfect characteristics of a given home because other prospective buyers may not be able or willing to do so. If the seller is under pressure and wants the house sold quickly, they'll prefer to work with the buyer that can accommodate them the most. If you are willing to make the investment, then you must be a qualified, solid, desirable buyer. Get a copy of your credit report and settle any debts that may be outstanding. "You'd be surprised how many people get turned down for a loan because of an old debt they had forgotten all about." Get pre-approved for loans and mortgages. Sellers want and need a willing and able buyer, someone who is stable and ready to make a commitment to the property; and that after making the commitment, can carry it through to closing without problems. Going into the negotiation process as a pre-approved buyer puts you at a major advantage. Create a rapport with the seller and let them know why you prefer their house to others. Homeowners are emotionally connected to their home. Even when selling their home, they often feel tied to the integrity of the house. They have likely spent a large portion of their lives within its walls. Often, fond memories of the family are interconnected to their home. Because the seller loves the house, they are usually inclined to sell it to someone who will love it too. Be willing to increase the size of your down payment or make an all cash offer. Sometimes the best way to win a bidding war and avoid paying a higher price is to increase your down payment. Sellers favor strong buyers, if you can afford to make an all cash offer, do so. That's almost always a definite way to slam-dunk a sale and it certainly does not preclude you from getting financing later if desired. Be sure to choose a sales associate who has an excellent reputation with other agents. Working with a KARLHAUS REALTY™ Associate who is known in the industry for their knowledge, integrity, professionalism, and credibility will always work in the buyer's favor. We at KARLHAUS REALTY™ at the Spruce Creek Fly-in not only sell the Fly-in lifestyle, we live it! SPRUCE CREEK.- KARLHAUS REALTY, known for selling the most exclusive and unique homes in the area, has again been featured in the newspaper. A feature in Sunday's real estate section covers 1185 Private Road, a new listing marketed exclusively by Karlhaus. Perched on one of Florida's rare natural hills and surrounded by spectacular gardens, pastures and ponds, this Frank Lloyd Wright Prairie Style home is the ultimate country retreat. Ornate Electronic Security gates and a winding private driveway surrounded by trees greet the visitors to this nature paradise. The One of a kind home is an architectural masterpiece with floor to ceiling glass windows and extensive decking that blends with the landscape. In true FLW fashion, the building and its landscape are connected in harmony. The architect's design process was derided from natural laws rather than philosophical idealism or classical rules. Earth-toned colors are fused both on the interior and exterior, mimicking shades found in nature. The Listing Agent is Carlos Bravo. CAUTION - Watch for Low Flying Aircraft before teeing off! Where else in the world can you play golf at your own private airport? and fearful when others are greedy. Of course, you shouldn't get greedy when others get greedy and fearful when others get fearful. At a minimum, try to stay away from that. All information in this site is deemed reliable but not guaranteed. No representation is made to the accuracy thereof, and such information is subject to errors, omissions, prior sale, withdrawal, or changes in price, rental rate, commission, lease or financing terms without notice. All square footage and dimensions are approximate. All parties are expected to conduct due diligence and are advised to retain the services of appropriate professionals to verify and ensure the information is correct and meets their requirements. KarlHaus Realty supports Equal Housing Opportunity. We encourage users of our site to follow appropriate guidelines to comply with the Federal Housing Act as well as any applicable state and local regulations.